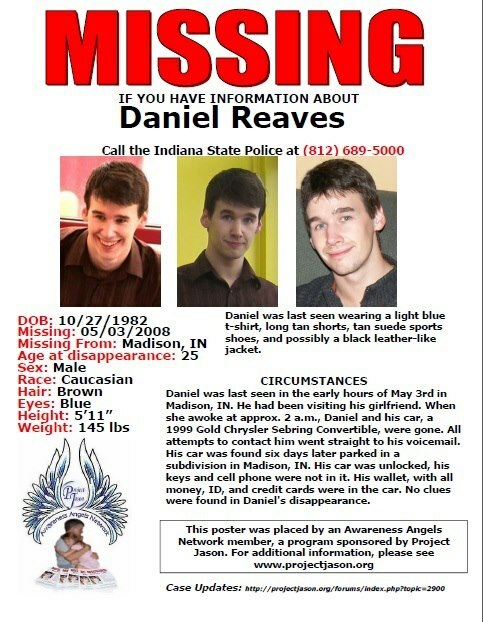 Daniel Reeves, 30, has been missing from Madison, Indiana since May 3, 2008. He was last seen in the early hours of May 3rd in Madison, visiting his girlfriend. When she woke up, Daniela nd his car, a 99 Gold Chrysler Sebring Convertible were gone. His car was found 6 days later parked in a subdivision in Madison. The car was unlocked, his keys and cell phone were not it it. His wallet with all his money and credit cards were in the car. Daniel has not been seen since. Please call the Indiana police at 812-689-5000. If you know his whereabouts, or leave an anonymous tip here.